Overhead Door of Permian Basin Blog! Hellllooo, three day weekend! As you’re reading this, many of you may be packing up to head out of town. 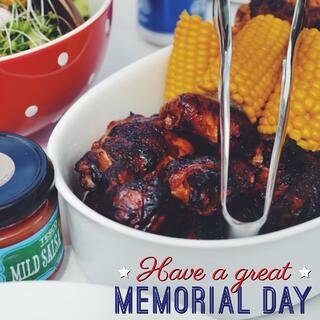 However, if you’re staying in town, here are some of Overhead Door’s tips on our favorite Memorial Day party tips. First and foremost, Overhead Door wants you to remember the reason for this holiday weekend. Until 1971, Memorial Day was traditionally celebrated on May 30th. The federal government adopted the holiday as the last Monday of May as a way to honor and remember the soldiers who had lost their lives fighting for our country. To start your Memorial Day, we encourage you to honor the men and women who made this day possible. You can do this by attending a celebration at your nearest veterans memorial, going to a parade, or privately remember our troops. Your garage is actually one of the best places to host a party – assuming it’s clean! Before the big bash on Monday, we recommend following our tips on getting your garage organized. Make sure that it’s free of any stains and chemicals, especially if you plan to serve food out of it. Though it’s a little late to get started for Memorial Day, we recommend adding these amazing Lifestyle Screens. They can make your next holiday celebration a big success. Lifestyle Screens allow air to circulate through your garage while keeping bad weather, insects, and pets out. Get your estimate today! Decorations sometimes take up more time than you’d like. Keep your décor simple by using indoor/outdoor twinkle lights, festively colored tablecloths and utensils, and small American flags. If you plan to use your garage as the designated party area, make sure that any surfaces are clean of chemicals. If children will be in attendance, it’s also important to make sure that sharp tools and potentially toxic substances are stored elsewhere. Keep dairy-based (mayo-included) items refrigerated or on-ice. Food-borne illnesses occur frequently when items like potato salad or deviled eggs are left out too long. Cook as you go. Though it’s easier to cook everything at once, it’s best to cook what you need. That way, there’s no food sitting out to spoil. 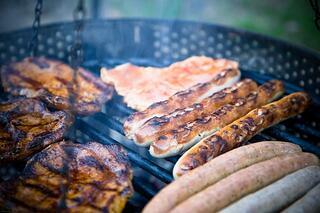 Make sure meats (particularly chicken) are thoroughly cooked through. Use tiki torches, citronella, or fans to keep insects away from picnic areas. However, we encourage you to be cautious about any open flames. Keep food in the shade. If you’re enjoying the Memorial Day holiday party in your garage, you’re good to go! All of us at Overhead Door want to wish you a very happy and safe Memorial Day. If your garage door decides to misbehave over the weekend, we're available to help. Your garage is often one of the messiest places of your home. It sees a lot of traffic because it's also used as a storage area. However, it's important to keep your garage tidy for health and safety reasons. 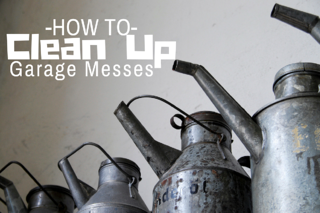 We're here to share some tips on how to clean up garage messes, based on common issues people see. Whether it's from storing vehicles or yard equipment, it's highly likely that your garage has seen its share of oil leaks. These leaks can cause a big mess, whether it's from staining your floors to being tracked into the house by an unknowing pedestrian. They can also be dangerous. Many slips and falls occur from oil or grease spills. However, they are relatively simple to clean up. If there is standing oil or grease, you can use a surprising ingredient to soak up the excess...inexpensive clay kitty litter! Sprinkle the cat litter on top of the standing oil or grease. Over the course of the day, the litter will soak it up. Simply brush the litter granules into a dust pan and dispose in the trash. You can also use sawdust. If you notice stains on the floor, we recommend check out this blog for more information. Dust frequently to remove spider webs and wasp nests. Hire an exterminator for quarterly pest treatments, particularly if you have continued issues. Patch any broken windows or holes leading into your garage. Many Americans keep a second refrigerator in their garage. Others use it as a place to get together and host cookouts there. This can lead to all sorts of messes. Exploding sodas, spilled food, or broken cleaning supplies such as soap can make a big, slippery mess out of your garage. It's important to clean up these spills as they happen to avoid any really nasty messes. However, if you don't catch them in time, you can usually clean up sticky messes by combining extremely hot water with a grease-cutting liquid detergent (such as Dawn). Soak up the solution with a towel and place over the sticky substance for 30 minutes. The heat from the water and grease cutting agent in the detergent will make the mess easier to clean up. Looking to hide your messy garage with a beautiful new garage door? That's no problem at all! Our design consultants are here to help. Today, we're here to bust a few myths about people's expectations about garage doors. 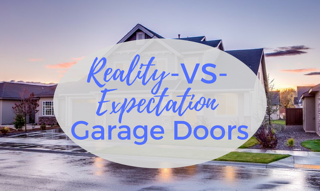 While you may be wondering what kind of "mystery" is involved, read on for more to discover garage doors, reality vs. expectation! Expectation #1: I Don't Have To Maintain My Garage Doors After They're Installed. Reality: False, false, false, false, FALSE! While it's true that garage doors require less maintenance than, say, your lawn, there are still steps you should take to keep them running properly. For the DIY'ers, read our blog on maintenance tips. Otherwise, just give us a call. We provide service calls! Expectation #2: Garage Doors Are Boring. Reality: Again, this is another falsehood. Garage doors can make a serious statement. They also come in various materials, from aluminum to glass, and in a variety of colors. Interested in seeing what a new garage can do for your home? Check out our design center to get an idea! Expectation #3: I Have To Buy A Commercial Door From A Specialty Company. Reality: Nope! Overhead Door provides a large selection of commercial doors for your business. We carry everything from security grills to fire-rated doors. These also come in various colors, materials, and sizes. Interested in finding out more? Set up an estimate today! Expectation #4: Garage Doors Are Too Expensive. Reality: While a quality garage door can be viewed as a "large" purchase, you have to consider its "shelf life." In most situations, if properly maintained, overhead doors can last a long time. When you figure out your return on investment, you're looking at a small amount over the years. Our selection provides high quality doors in various price ranges. Expectation #5: Garage Doors Just Keep People Out Of My Property. Reality: Garage doors do WAY more than that. If you read our blog on inclement weather, you know that your garage doors provide a level of safety for your home or business. High winds, tree branches, and debris can cause a significant safety hazard. High quality overhead doors can prevent that. Did we bust some myths today about your garage door feelings? Part of our job is to educate our customers and make sure that they have all of the knowledge they need to make an informed decision. Want to find out more? © 2014 Overhead Door Corporation. All rights reserved.